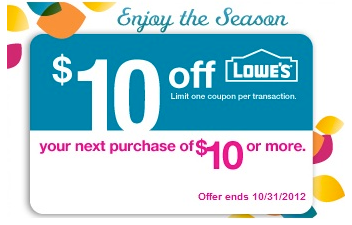 Lowes is offering a $10 off $10 Purchase coupon that is valid in-store or online when you register for My Lowe’s. The coupon will be sent to you through email and may take between 24-48 hours to arrive. Promotional Coupon cannot be used in conjunction with any other coupon or discount. Coupon is good for a single receipt purchase of any in-stock or Special Order merchandise only. Coupon is not redeemable for cash, is nontransferable and cannot be replaced if lost or stolen. Void if altered,copied, transferred or sold through any online auction. Limit one coupon per household. Not valid on previous sales, purchase of services or gift cards. This coupon is valid in the U.S. only. BJs Wholesale Club Free 60 Day Pass Printable coupon High Value Coupon For Glade Expressions Oil Diffuser Starter Kit!